RANGOON – The Rangoon Police Force on Friday detained another member of a family accused of the trafficking and abuse of two underage domestic workers at a downtown tailoring shop, according to a statement released on Facebook. Ko Yazar Htun was arrested on Friday afternoon, according to the police report. His sister, Ma Thiri Latt, remains at large. On Tuesday, police first arrested Daw Tin Thuzar, the mother in the family, while father U Ko Latt, daughter Ma Su Mon Latt and another family member, Ko Tin Min Latt, were apprehended Wednesday. The police statement said the two victims, San Kay Khaing, aged 16, and Tha Zin, aged 17, had suffered five years of abuse at the hands of owners of the six-floor tailor shop and factory on 40th Street. The two girls were beaten with wooden rods and broom handles, scolded with boiling water, jabbed and scratched with scissors, and had their fingers bent back painfully. The victims have a large number of scars and marks reportedly caused by members of the family. Burma’s Anti-Human Trafficking Unit filed charges against six offenders as per Burma’s Anti-Trafficking in Persons Law. According to Article 24 of the law, anyone found guilty of trafficking in persons can be punished with a minimum prison term of 10 years and a maximum sentence of life imprisonment. Article 32 imposes the same punishment for anyone who “prepares, attempts, conspires, organizes, administers or abets” in any of the offenses stated in the law. On Thursday, Dr. Win Myat Aye of the Ministry of Social Welfare, Relief and Resettlement announced the ministry is currently taking care of the two victims. It will act as a plaintiff and file a case under Section 66(d) of Burma’s 1993 Child Law, which states that willful mistreatment of a child can be punished with two years in prison and/or a 10,000 kyats fine. The case has received a lot of online attention. Netizens believe there are many similar trafficking, abuse, and torture cases behind closed doors. Unfair and corrupt employers taking advantage of young or uneducated employees and then settling the case with cash compensation are commonplace in Burma, they said. 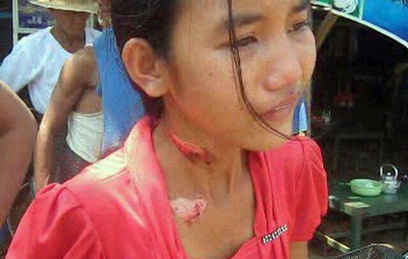 The Irrawaddy reported in May 2012 the case of 15-year-old Aye Yu Aung of Kyaukgyi Township, Bago Division, who was burnt with an iron by employer Daw Phyu Win Thet, wife of deputy township judge Aung Phone Win of Bago. The victim’s mother filed a case against Daw Phyu Win Thet in 2012 but as the family was too poor to hire a lawyer or attend court, the case never went to court. In August 2016, the owners of Pandora weight loss center in Pyin Oo Lwin town of Mandalay Division were found to have physically assaulted eight female employees, locking them in dog cages and slapping them repeatedly. The victims were all paid below the government’s minimum wage. Women’s rights activists from Mandalay rescued the women from Pandora and filed a case against the owners. Police hesitated to take action, however, as the family allegedly is linked with an ethnic armed group. Correction: This story originally reported that both Ko Yazar Htun and Ma Thiri Latt had been apprehended on Friday. It has since been updated to both clarify family relationships and to show that, at the time of publication, Ma Thiri Latt had not been arrested.